MasterChef premiered Stateside in 2010, and, by virtue of its quirky contestants, intense challenges, and charismatic judges, quickly established itself as network TV’s best—and most successful—contribution to the culinary competition genre. 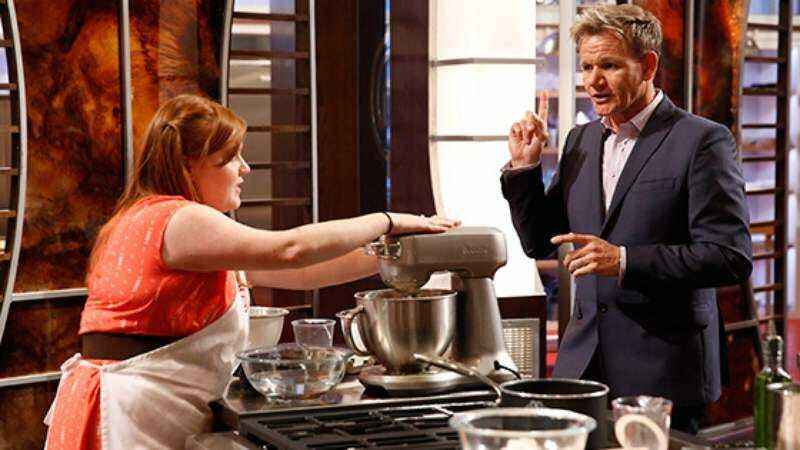 In each season, talented home cooks from across the country compete for cash, a cookbook deal, and the “MasterChef Trophy,” which host Gordon Ramsay—much more reserved here than on his various other programs—would have you believe is more valuable than cash and a cookbook deal. An international phenomenon, the program currently boasts separate competitions in more than 40 countries. There’s even a spin-off series, MasterChef Junior, where 10-year-olds cook gourmet dishes their parents probably couldn’t pronounce. In May, the U.S. edition launched its sixth season. Elise Mayfield, a native Alabaman, was an actress and e-learning administrator in Chicago when she appeared on the show’s fifth season last May. Though she only made it halfway through the season, she stood out as one of the show’s more memorable personalities, thanks to her charming Southern twang and propensity for waterworks. The A.V. Club talked to her about the experience, anxiety-induced hypoglycemia, and how Gordon Ramsay really does care. The A.V. Club: So how did you end up on the show? Elise Mayfield: I went to an open call in September of 2013. It was the MasterChef open call, and I heard about it through friends. I found out about it less than 24 hours before the event was happening, and I had a meeting that was scheduled at my house the day of the open call so I basically said everyone can come over and have that meeting but I’ll be in the kitchen while the meeting is happening. So I stayed in the kitchen and I made chicken pot hand pies and a Brussels sprout slaw with a honey mustard and bacon vinaigrette. And I knew the one thing they said in the open call was that they wouldn’t have any heating or cooling elements, so you would have to find a way to keep your food hot or cold, or make something that could be at room temperature. So I came in with two insulated lunch bags. One of them was an aluminum foil takeout container and I had a sock—a clean sock!—full of rice that I had heated up in the microwave, along with these glove warmer things so I had that and a heated bag of rice in the insulated lunch bag. For the slaw, I had that in a cold one with a couple little ice packs. So they told us to show up with a dish and then there was a pre-registration form we had to fill out with basic information so they told us to bring that. The only other thing was to be ready to talk to people. And that was it, those were the guidelines. So it was pre-registration, bring a meal, and bring yourself. AVC: Who did you talk to? EM: The first people I talked to inside—they had a whole kind of casting/wrangling team that was there at the very front of the line so I saw people when I first got there and told them what my dish was gonna be and they gave me a number and wrote it on a nametag. Then, once we got into the actual audition, there were chefs there to taste the food and more producers and… it all went very quickly. AVC: Who were the chefs? Did you know them? EM: No, I didn’t know them. But they were scary. AVC: How did they react to your food? EM: It was just very, very serious. The tone just all of a sudden got… it was an interesting combination of a lot of nerves from all the energy—I was probably in a room with, like, 20 people—and there was so much nervous energy from all the people that were crossing their fingers that something would happen. The chefs were tasting food and also critiquing, so people were getting critiqued on the spot which was not something I had expected. Then, on top of that, you’re also talking to producers who wanna know what your personality is like. So, from the very start, there’s this pressure to cook and also be a big enough personality to differentiate yourself from all these other people in the room. AVC: Did they give you any critiques? EM: Yeah, so the first hand pie that he cut into was under done. And I was mortified and thought, “I’m done. This is it.” I asked him if he could try the other one on the plate, and he did. That one was cooked through and I was like, “Thank God.” He saw there was one Brussels sprout with a piece of core. He picked it up with the edge of his fork and was like, “How did you cut these?” I said, “I used my food processor,” and he was like, “I would’ve used a paring knife around the edge.” It was intense. I was like, “Man. Okay.” I thought it was done. I had dough that was underdone and a piece of Brussels sprout core and this is clearly not gonna go well. AVC: When you were talking to the producers, were you conscious of creating a character that would stand out? EM: No, I think one of the things I decided while I was going through this whole process was that I was not going to try to shoehorn myself into a specific character. Especially during that first audition, and all of them really, I really tried to stay true to myself. Maybe I was a bit more outgoing than I naturally am, because I am actually a bit of an introvert, but yeah, I definitely did not go in as a character, I went in as myself. AVC: How long until they followed up? EM: I didn’t hear official word for many, many months. The audition process is many months long. There’s communication throughout that whole process but it’s also months and months and months of “different steps” and “waiting to hear from people” and “waiting to submit things” and deadlines for me to submit things and deadlines to hear back from them, but, ultimately, I didn’t hear back until four months later about going to L.A.
AVC: How much time did you have between finding out and going to L.A.? EM: I had 10 days’ notice. What I was told—and I think everybody will know this from the way the show is set up—but when I got the call to go, I mean, I was basically told, “This is not a guarantee that you’re on the show, this is not a guarantee you’re going to meet the judges, this is a not guarantee of anything. It’s just the final audition.” I was told to pack for a couple of months so that was nuts. It also meant there was a week where I had time to figure out what I was going to do with work, figure out what I was going to do with my apartment, figure out what I was going to do with my car, and who can come into my apartment and water my one plant that I haven’t killed. For me, I was really lucky because I was able to keep my job. I mean, a lot of people really quit their jobs to go to that show. It was a weird conversation to have with the HR lady. She was like, “I don’t even know what to do with this. This is unprecedented.” She had to talk to her peers about what to do. But I ended up being really lucky because they said by the time I got back, even if I were there the whole time, they couldn’t really hire somebody else and train them in that time, so I was really lucky. AVC: Let’s talk about your life before the show. As a kid, were you always cooking? Or is it something you found later in life? EM: I didn’t start cooking until college, really. That honestly started with boxed cake mixes. I remember the first thing I ever made that was homemade was a boxed yellow cake mix and this chocolate frosting that my mawmaw still makes, a boiled chocolate frosting and it’s the best thing ever, I swear. So, that’s like the first thing that I remember, and it’s also the first thing people started requesting that I make. That was in college and I probably didn’t get into cooking until after I moved to Chicago, which was almost eight years ago. So, probably after I moved here was when I started missing food from home. EM: Birmingham, Alabama. So I started missing food from home and I realized the only places to get Southern cooking in Chicago are at specialty restaurants and they’re all really expensive. I’m used to go going to what we call “Meat and Threes”: it’s cafeteria style and it’s cheap and you get a meat and three vegetables. So, I started cooking more on my own. I was an incredibly picky eater as a kid, so I actually didn’t eat a lot of vegetables until I started cooking them myself. My palate, over the last seven or eight years, has expanded wildly as I’ve figured out why things taste good, and how they should be cooked and things like that. So yeah, definitely didn’t really figure out how much I loved cooking until very recently, like the last few years. AVC: What do you think they saw in you as a cook that made them want to put you on the show? EM: I think everyone on that show really, really loves food and I think I tried to approach the show being as open and honest with myself and my relationship with food as possible. I went in there with my heart on my sleeve from the very, very, very first audition. I was also going through a rough time here in Chicago. I was going through some big life questions about what I was doing with my life because my other focus outside of my job was doing theater, which I’ve been involved with since I was literally 3. I was feeling really discouraged about that choice and the amount of time I had put into theater and it was kind of pushing me more and more toward the culinary world. So I was in a transition period and I honestly never thought that I would end up on the show, because I knew how many more experienced cooks were gonna be there. AVC: And, as an actor, you know how competitive auditions are. EM: Right, and I had just lost a role that I had very point blank, like, told the casting people that I wanted. Then I didn’t get it. It felt like I had been continually rejected from everything, then I show up to this open call where I’m just who I am and I actually ended up on the show, which was very affirming. AVC: So what happened when you got to L.A.? EM: L.A. was interesting. You’re immediately thrown into this pool of total strangers, and for someone who has social anxiety disorder… [Laughs.] It was scary, and I put my best face forward and we’re all kind of in a hotel together and you just have to make friends. Luckily, because it’s reality television, a lot of people are very outgoing and friendly and it made it a lot easier for someone like me who is not going to be the first person to say hello. AVC: So you were all at one hotel? EM: Yes. There were a hundred of us. AVC: What was the first night like? AVC: How did they diminish it from a hundred contestants to 30? EM: Really similar stuff to what happened on the very first day. Cooking and talking to a producer, but with a smaller pool. We knew at some point there was going to be a cut, but we didn’t know how many people were going or when it was going to happen. It was nerve-wracking. Some people went out and kinda partied and had a bunch of fun, and I went out and had, like, one or two drinks at the pool, but then I was back in the hotel room, watching reruns of Law & Order. I knew that the next day could be a huge day, but there was no way to know. On the fourth or fifth day, we had a big meeting and they read off the names of people that would be staying. They did the whole cut right then. 70 people were eliminated. AVC: Were you confident you would make it? EM: No. When they started listing names, I immediately started counting. We didn’t know how many people at the time, but my initial thought was, “You need to start counting right now.” So I started counting, and they read all the boys names first and—oh my god, I just realized this: I counted 15 boys and I thought, there’s gonna be 15 girls, and I was the 13th name called, and I was also the 13th best home cook. I was eliminated in 13th place and I never put that together until right now. [Laughs.] When my name was called, I think I “beauty queened,” like hands to the face. [Gasps.] There were a lot of people that were like, “Yeah! Woo!” I just immediately started crying, which I guess was the theme of my entire time on that show. AVC: What was the first day of filming like? That reaction shot of us walking into the kitchen for the first time is a true reaction. When we walked in, we couldn’t see anything, it’s in this giant soundstage. They had us lined up backstage and then, all of a sudden, those big double doors open and it’s there. It’s a TV set, but it’s big and beautiful and well-crafted and there’s all this gorgeous kitchen equipment and you can hear the hum of the ovens–they’re on, you can hear them. AVC: Had you met the hosts beforehand? EM: No. We walked in and got into place, and we actually had been standing there for a little bit. We didn’t really know what was going on, and I was next to Cutter [Brewer] and we were chit-chatting, “Wow, look at all of this, look at the pantry! Oh my god, the equipment room!” And then Gordon Ramsay walks out and like, Joe [Bastianich] and Graham [Elliot]. I think there is this moment of me, if I remember from the first episode, where I’m fanning myself and crying and that is totally legit. I was super overwhelmed. That was the moment where I realized I have to cook for these people and I’m not that good. I think everybody had more experience than me. Basically everyone. AVC: So, that first challenge, you were making your signature dish? EM: Blueberry, goat cheese, and basil hand pies with whipped cream and almond brittle. AVC: Where’d you come up with that recipe? EM: I’d been making that pie for a while. It had been auctioned off a few times. I started making hand pies, which was something I’d seen on the Smitten Kitchen blog, but this was the first time I put those together. I had been making other fillings for the hand pies, but this was the first time I ever put them together. AVC: The first time you put them together was on MasterChef? AVC: What was it like facing them for the first time? You hadn’t spoken to them before, right? AVC: When you go up there, how long does each judge spend eating your dish and talking to you? EM: They spend quite a lot of time. They would come to our stations and check and see how we were doing while we were cooking. Then, the actual critiques, they were pretty lengthy. They all spend significant time on the dishes, regardless of whether they’re bad or good. If it was good, they will tell you why it’s good. And, if it’s a bad dish, they would certainly tell you why it was bad. Like, really tell you why it was bad. AVC: Who were you most scared of? EM: Oh. Joe. A hundred percent. AVC: When you’re cooking, are you allowed to have recipes at all? AVC: Even if it’s baking? EM: No. No recipes. It’s scary. There are moments when you’re like, “Oh my god, it worked!” I don’t know any other way to explain it other than that it is amazing what the human brain can remember when you’re under pressure. I think we all just spent a lot of time—I spent a lot of time preparing before I left. I basically put myself through a mini culinary boot camp where I made flash cards and memorized recipes. I quizzed myself all the time. I still have my notecard box with all of them. For baking, I memorized recipes for cakes and biscuits and pancakes and waffles and all kinds of stuff. There’s no recipes and there would be moments when I would be like, “Do I know what I’m doing?” If you don’t, you risk embarrassment on national television. That’s how high the stakes are. AVC: People are going to see it. EM: Yes, people will see it. AVC: As the days went on, did it get easier? Did you become more accustomed to the cameras? EM: Once you get into the kitchen, and you’re at your station and they start giving you information, the cameras just disappear. There’s so much else at stake and those time limits are 100 percent real. They are not fudged for TV. They’re real, and when they say the clock started, the clock started. AVC: And you truly didn’t know what was in a mystery box? AVC: How about when you went off-site? Did you have any idea where you were going? EM: Nope. That first one, where we went out to the army base to cook for 500 soldiers, we didn’t know where we were going. I had this moment in the van where I realized, “I am riding in a van with seven people who I don’t know, and we’re in the middle of the desert and I don’t know where we are and, in any other circumstance, this would be crazy and I would need to call somebody to immediately come and get me. AVC: So your contact with outside people was limited? AVC: What was it like being eliminated? There was a moment in that episode where it seemed like you fainted. Anyway, the things that led to me passing out… the diner challenge had happened, and that was filmed on a Friday. And we were at the diner, and we were about to start cooking. I realized I was going to pass out. AVC: Were you sleeping well at that point? EM: No, I was probably getting—this is going to sound like a lot to some people—but I was probably getting five to six hours a night. On bad nights, about four hours. Which, for me, is just not enough sleep. I knew that, but there was nothing I could do, because I was so wound up after filming for the day that it was hard to go to sleep because I would be super nervous about the next day and about how things that happened that day were going to look like on camera. All of those things. The challenge starts, I start to cut my fish, and I’m trying to concentrate but I start feeling clammy. I’m cutting it, and then I cut into the fish, and I’m like, “Why did I just do that?” I stepped back. I was like, “Wait a minute. something is wrong. Oh my god, I’m gonna pass out.” And I’m holding this super sharp filet knife. I’m covered in salmon. I say, “Medic,” and I’m trying to speak very quietly because we had our lapel mics on so they could hear any sound, even if we whisper. So I wasn’t saying it very loudly. I didn’t realize Chef Ramsay was directly behind me at the station, and so he sees the commotion and is like, “What’s going on?” And, because I’m covered in salmon, he’s like, “She’s cut herself!” I said, “No, but I am about to pass out.” Luckily, he ended up being behind me to catch me when I passed out. After I drank some glucose, I started feeling better. I wasn’t 100 percent, but I decided I’d go back in and try to finish the meal. It wasn’t my best, but I finished. They thanked me. Graham Elliot said, “Good job, thanks for coming back and pulling through.” That was what we filmed that day. I still wasn’t feeling well the next day. I felt better, but I was so terrified it was gonna happen again. The elimination challenge was a basket challenge. We got Joe’s basket—Christian [Green] picked the right one, it was the most difficult—and I just don’t cook a lot of Italian food so I was out of my comfort zone. I was also so nervous that I would pass out again, so I just had the worst day in the kitchen of all time. I failed at making dough, which is what I do! I still don’t know how I messed that up so badly, other than that I was so nervous that I was gonna pass out again. I couldn’t think about anything else. Then I was eliminated, and I told them when I got up there that I failed that day and 100 percent knew why I was going home. I was sick, and the doctor eventually said he thought it was anxiety-induced hypoglycemia. It took me about three or four months after the show to get to where I wasn’t having hypoglycemic episodes. AVC: Did you leave the day that you got eliminated? Or the day after? EM: I was set to leave the next day, but I had written down the number of my best friend Haley, who lives in L.A. I asked if I could give her a call, and I left her a voicemail that said, “Hey! It’s Elise. You remember when I talked to you five weeks ago and told you I was in L.A? I’m actually still here. I’ve been here the whole time. I’m wondering if I can stay with you for the weekend.” She called the number back and got one of the wranglers, who was very confused why this girl was calling, but eventually got the phone back to me. They let me stay for the weekend, which I’m really glad about because it gave me some decompressing time. God bless Haley because I was a mess that weekend, a total wreck. AVC: How did you feel immediately following the elimination? What was that weekend like for you? EM: Surprise, surprise, so much crying. So much crying. I knew I was sick, so it was a sense of relief because I knew if I kept going I was going to continue to get sick, that this was a thing that was related to the stress of the show. In a sense, I was relieved to not have that amount of pressure, but also so incredibly disappointed with myself that I wasn’t able to push past the… I wasn’t able to believe in myself enough to push past all the negative comments and not-so-hot reviews of my food. I didn’t believe in myself enough to not let those things affect me, and, in fact, let them bore into me so much that I ended up with a weird medical [condition]. So, that weekend was rough. I kind of cried uncontrollably for two hours after it happened, because it was a weird mix of being relieved and very disappointed. The real world just came flooding back to me. And it was really scary because I’d been isolated for so many weeks, and getting my phone back and realizing I had a thousand emails to read was shocking. AVC: You didn’t check your email for five weeks? EM: It was pretty awesome! It’s amazing when you don’t have social media how much you don’t need it. AVC: How long was it between when you went home and when the show premiered? EM: I think it was about two or three months. That was a weird time because I couldn’t talk about it. I had disappeared for almost two months and then I wasn’t able to talk about where I had been, so it was a little like I was in the CIA. AVC: Were you nervous about how you were going to be portrayed? EM: Oh, so scared, because I knew it was totally out of my hands. There was nothing I could do about what was going to show up on TV. I had no control over editing. I didn’t know how I was going to be portrayed. I knew that as a risk going in, so that was really scary. I was also really scared about the social media aspect. I was terrified of what it was going to be like to suddenly have thousands of people trying to follow me on social media and have a say about who they thought I was. AVC: And how did you deal with that when the show premiered? EM: Social media is hard. And it was definitely the first and probably the only time I’ll ever deal with strangers having a say about who I am. Ultimately I had to turn over my Twitter handle to a friend who kind of weeded through the things that had been tweeted to me. She let me know about the things that were good and the things that were, like, critiques that were not trolling or weren’t extremely hateful. I did get some of those critiques and that was fine and fair, but she also weeded out the possibility of me reading some of the very not nice things that were posted about me. Unfortunately, some of those did get back to me because people found ways to contact me through my website, and there were some Facebook messages that were sent. There were lots of comments about my looks and people thought I couldn’t cook and didn’t know why I was on the show. That’s hard to swallow. AVC: How about watching the show? How do you feel you were portrayed? AVC: So you feel like it was you? EM: That is me on the show. That is me. They cut out a lot of the crying, but that’s me. They would basically wait for me to get it out of my system and then ask me some questions. I was who I am on that show. No character, it’s me. It’s me in an extreme circumstance. I’m proud of the work I did on that show. I’m very proud of it. I’m proud that I remained who I am. And even if that meant that I crumbled under pressure, it was still me. AVC: How did it change your cooking once you left the show? EM: Right after the show it took me a few months to get back into the kitchen. I left the show feeling bad about myself as a cook, so it took a few months before I felt ready to go back in and make a full meal. Once I finally got back into the kitchen I realized how much I had actually learned and how much better that show made me. I mean, personally, my time on that show is kind of my marker: If Ican make it through that, then I can make it through most things. Cooking-wise, I have learned so much over the last year. I think that my cooking skills have grown exponentially since my time on that show, because I learned from the people that were there. I learned from my fellow contestants. They made me braver. They inspired me to look at different techniques. Professionally, I’ve been doing some catering with my company Honey Baby Bakery. I’ve been doing desserts for weddings, and I’ve done a couple of cookie deliveries for offices. Sweet treats are still my favorite, so I’ve been doing lots of sweets, but next week I’ve got my first private dinners. Six-course meals. So that is really scary and exciting. I’ve been working with a couple of different sous chefs and working on creating menus. So I’m kinda branching out, and maybe it’s a little slower than some other people have, but I feel like my learning curve has been huge over the last year. I think the show made me a much better person. It was just a really, really hard growing pain. Really extreme. AVC: Have you encountered anybody from this current season?